Dams and reservoirs provide several benefits, including water storage for future use, flood protection, or hydroelectric power generation. 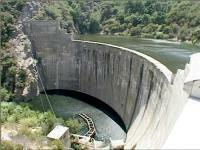 As dams age and are no longer able to serve their intended purpose, these structures are considered for removal. The gradual accumulation of sediment behind a dam can lead to structural safety and flooding issues which can spur consideration for removing the dam. Additionally, dams can prevent anadromous fish from accessing upstream historic spawning habitat, and modification or removal of a dam helps fish pass previous barriers. The California Coastal Conservancy is providing financial support for several dam removal projects with the goal of restoring native fish and helping re-establish natural processes in important coastal watersheds. The Conservancy has helped these technically complex and contentious projects move forward by leading dam removal planning processes in collaboration with various stakeholders, and by funding technical studies to inform feasibility assessments and designs The following dam removal projects have benefited from the Conservancy’s financial assistance. The San Clemente Dam Removal Project will remove an antiquated, unsafe dam on the Carmel River in Monterey County and provide unimpaired access to 25 miles of spawning and rearing habitat for threatened steelhead trout. 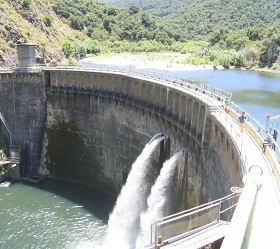 California American Water, the dam’s owner, resolved to undertake the project after the Coastal Conservancy agreed to assist with funding the cost of removing the dam, which exceeds the cost of strengthening the dam in place. The 106-foot high dam was built in 1921 to create a water storage reservoir, which is now largely filled with sediment and no longer functions as a water storage facility. In the early 1990s the California Department of Water Resources determined the dam could potentially fail in the event of either a severe earthquake or flood. The project has been identified as a high priority by several state and federal agencies as well as conservation organizations, many of which have contributed funding to the project. Currently, the Coastal Conservancy and CalAm are jointly funding the design and permitting phase of the project, estimated to cost approximately $6 million. The total project cost is estimated at $83 million dollars, with up to $35 million in estimated contributions from state and federal agencies and private funders. Construction is expected to start in 2012. The dam removal project presents a unique opportunity for public and private interests to work together to realize significant environmental benefits. More information can be found on the San Clemente Dam Removal & Carmel River Reroute Project website, and Carmel River Reroute and San Clemente Dam Removal Project page. The Matilija Dam Ecosystem Restoration Project will remove an obsolete dam on Matilija Creek, a tributary to the Ventura River, to restore the transport of sand and sediment to downstream beaches, and to allow passage for endangered steelhead trout to ancestral spawning habitat in the upper reaches of the Ventura River watershed. Constructed in 1947, Matilija Dam was intended to provide a local water supply, while offering flood protection for downstream communities. Over time, the build-up of sediment behind the dam has undermined both of those original functions. The Conservancy is engaged in this multi-stakeholder effort, led by the US Army Corps of Engineers and the Ventura River Watershed Protection District. The Conservancy was an active participant in development of the consensus-driven Feasibility Study, completed in 2004. Currently, the Conservancy is supporting pre-construction elements of the dam removal, including engineering designs and acquisition of downstream properties expected to be impacted during construction activities. The Coastal Conservancy has contributed more than $8.77 million in state bond funds to the Matilija project since its inception, and combined state agency funding of $15 million represents more than 63 percent of the total funding for the project since the beginning of the Feasibility Study. 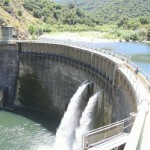 More information can be found on the Matilija Dam Ecosystem Restoration Project website. Photo Credit: U.S. Fish & WIldlife Service, Klamath Basin Ecoregion Collection. Four dams in the Klamath River basin are planned for removal in an effort to advance restoration of salmonid fisheries of the Klamath basin. Once home to the third-largest salmon run on the West Coast, management of the Klamath basin is the subject of multiple disputes regarding reliable water and power supplies, and declining salmon populations. While the Klamath River Hydroelectric Project was considered for relicensing by the Federal Energy Regulatory Commission in 2006, a separate Klamath Settlement Group formed to explore future management alternatives, including removal of Iron Gate, J.C. Boyle, Copco 1 and Copco 2 dams. The Conservancy provided approximately $1 million to fund studies to evaluate the feasibility and potential cost of removing these four dams. These studies characterized reservoir sediment, modeled sediment transport following dam removal, and assessed impacts of removal on biological resources and water quality. 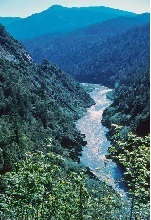 This information contributed to the development of the Klamath Hydroelectric Settlement Agreement (KHSA) and the Klamath Basin Restoration Agreement (KBRA), signed on February 18, 2010. The KHSA calls for a determination by the Secretary of the Interior on the Klamath River Dams by November 2011, following preparation of additional scientific studies through an open and transparent process. The Conservancy is currently providing matching funds for a water quality study under preparation as part of the KHSA. More information can be found on KlamathRestoration.gov. The Coastal Conservancy is currently assisting California State Parks, the Army Corps of Engineers, the Santa Monica Bay Restoration Commission and other partners in evaluating the restoration of aquatic and riparian habitat along Malibu Creek in the Santa Monica Mountains of Los Angeles County. The primary purpose of the Malibu Creek Ecosystem Restoration Feasibility Study is to address the impacts and possible removal of Rindge Dam, an obsolete, 100-foot- high water storage facility that was built in the 1920s but quickly filled in with sediment from the upstream watershed. 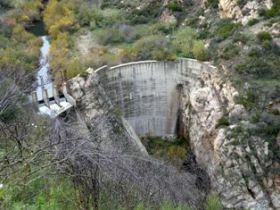 Located about four miles above Malibu Lagoon, the dam blocks habitat connectivity along the creek for endangered steelhead trout and other species, and prevents sediment transport to downstream beaches. The Feasibility Study is also analyzing fish passage opportunities at other migration barriers along Malibu Creek and its tributaries. The Conservancy is a member of the project’s technical advisory committee and over the past 10 years has provided State Parks with over $1 million in grant funding to support the study. The Corps has completed an administrative draft of the feasibility study, with a goal of completing a public draft of its study in late 2012 or early 2013. Project documents and other information about these dam removals can be found in the Clearinghouse for Dam Removal Information, a project of the Water Resources Collections and Archives.